The dramatic wildfire losses in California the last two years has homeowners' insurance companies canceling policies in similarly high-risk areas, reported Austin Colbers in the Aspen Times. The story was distributed by the Associated Press and picked up in numerous newspapers and websites. Most homeowners can still get a policy, however, insurers often make coverage conditional on homeowners managing trees and undergrowth. The story said the challenge is most acute in California, where wildfires caused $9 billion in losses to insured property in 2018. Advocates for property owners are pressuring lawmakers to help people find and keep their insurance. Maintaining defensible space around dwellings can reduce chances the home will be burned in a wildfire. 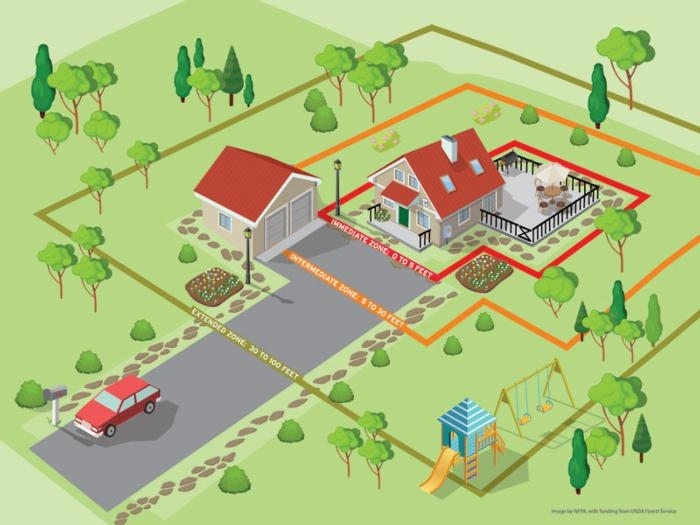 California law requires homeowners in high-risk areas to maintain a 100-foot defensible space around their homes. Since 2008 it has required them to use fire-resistant methods, such as installing vents that won't trap embers, in new home construction. But the new building codes don't apply to existing homes, said Yana Valachovic, forestry and natural resources advisor for the University of California Cooperative Extension in Humboldt County. And the defensible space rules don't focus enough on landscaping immediately around a home, she said.